Inspiration often strikes when you least expect it. For Chef Lau Siaw Dee , it was during a regular diving trip off the shores of Desaru. An avid diver, Chef Lau was out on a routine leisure trip with his friends when he caught a lobster and decided to cook it for dinner. As they were on an isolated island, he could only find rice from the locals so he decided to make porridge using seawater and the lobster. The fresh sea flavours of the lobster worked so well with the porridge that Chef Dee continued to experiment and refine the dish after he had gone home. 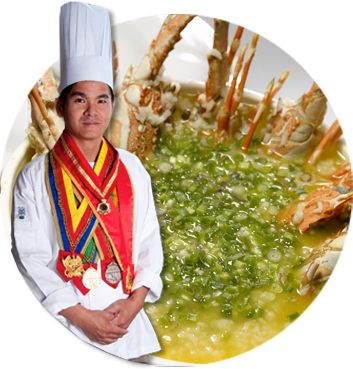 That was how 萬合樓 (Wàn Hé Lóu) signature dish - the award winning Lobster Porridge was born. This is but one of many delectable dishes created by culinary ingenuity of Chef Lau. Besides Chef Lau's other awards and achievement, this particular dish had won the top prize at a culinary event which was part of the 2008 Beijing Olympics. The porridge is cooked Teochew style with loose rice grains swimming in rich golden soup enhanced with lobster roe and accompanied by bright springy lobster. A blanket of fresh spring onions completes the dish, resulting in a dish that is comforting and yet fresh without being too rich. Besides lobster, the menu features a wide variety of dishes to complete a full meal, ranging from seafood to poultry to staples like rice and noodles. More than a Chinese restaurant, the establishment prefers to think of itself as a restaurant serving Chinese fare with local flavours. The restaurant is nestled in the heart of Singapore's Jalan Besar Heritage Trail, Wan He Lou offers the best of Chinese cuisine at the most affordable prices. Come experience our award winning Chef "Lobster" Lau's Original Signature Lobster Porridge and many favourite mouth-watering Chinese cuisines in a comfortable, cosy and casual setting. Come unwind and relax in this quaint and comfortable environment with your family and friends. The next time you are craving for rich comfort food, you know where to head!